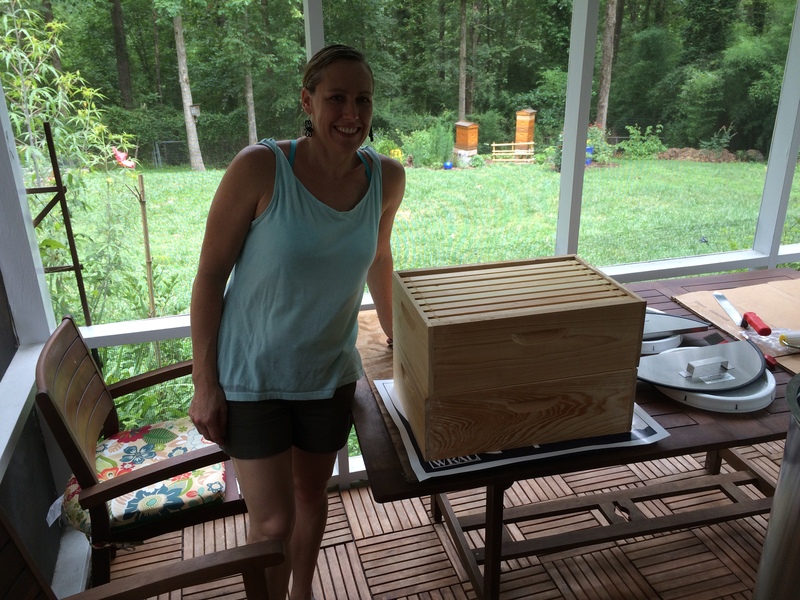 Change in Hive 2 weight during peak nectar flow (tulip poplar). We pulled 4 frames early as insurance, then less than a week ago we pulled an entire 8-frame super, giving 12 frames total. 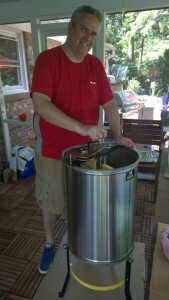 We set up our extracting equipment in our screened in sunroom. You can see the hives in the distance. 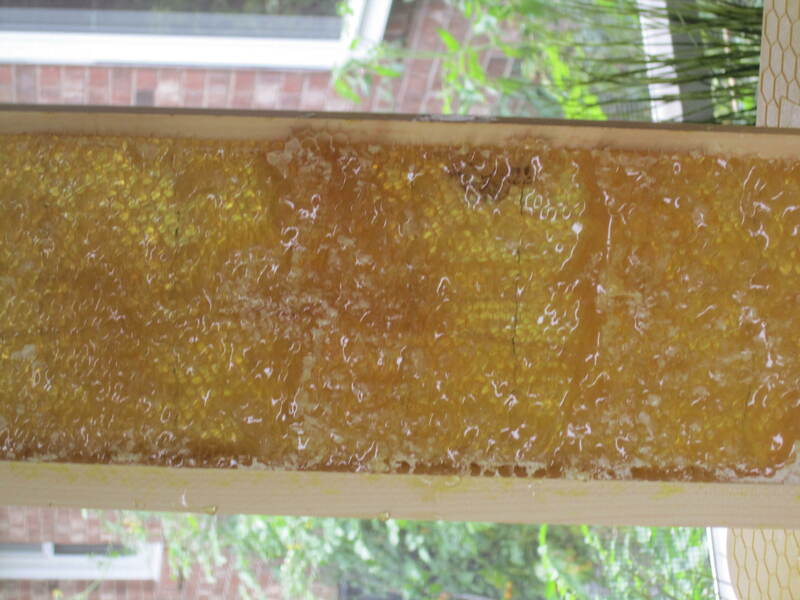 By the end of the extraction we had a a few bees buzzing around the outside of the screen trying to get at the tempting honey we stole from them. 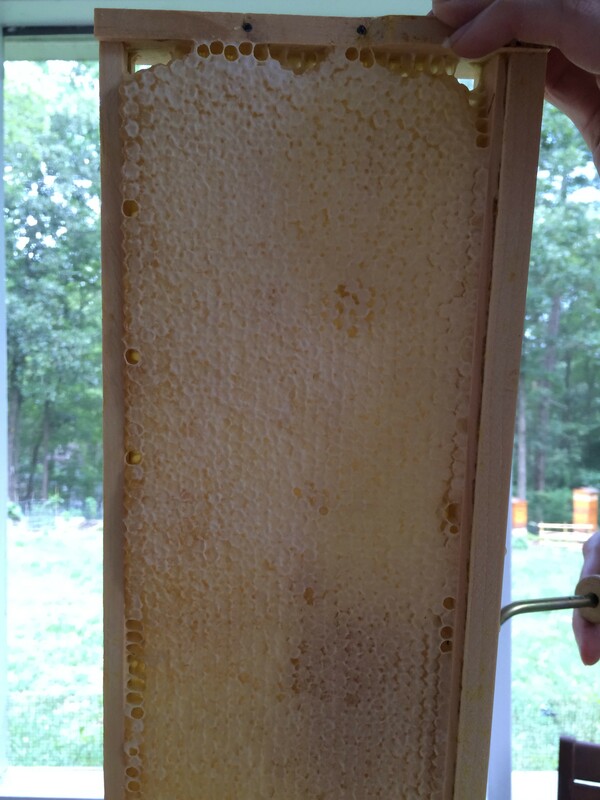 Beautiful frame of capped honey ready to harvest. 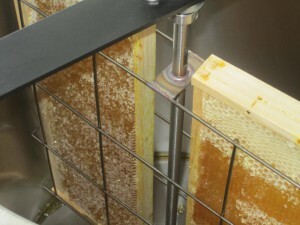 The bees fill the cells with collected nectar, but then they need to dehydrate it down to ~18% or less water content. They do this by increasing airflow through the hive, using the beating of their wings to generate an evaporative draft. 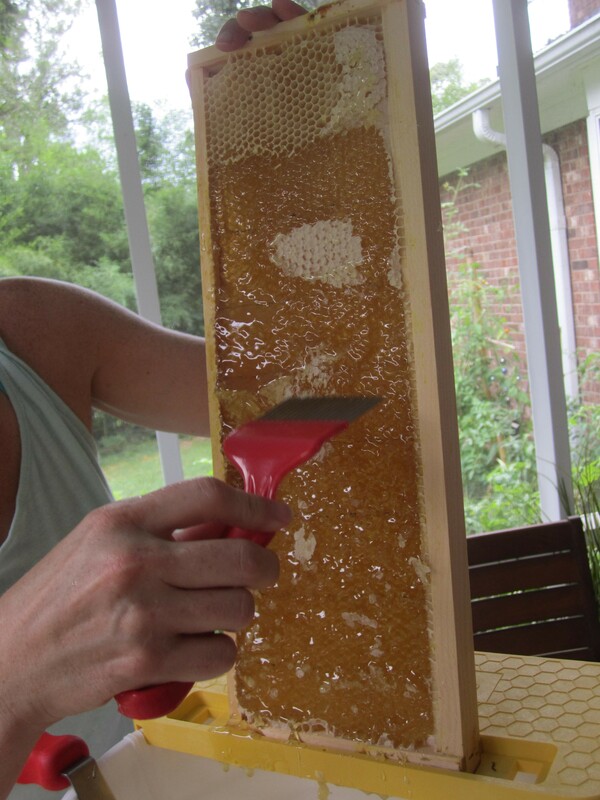 Only then do they add a thin layer of wax over the top of the honey-filled cell. 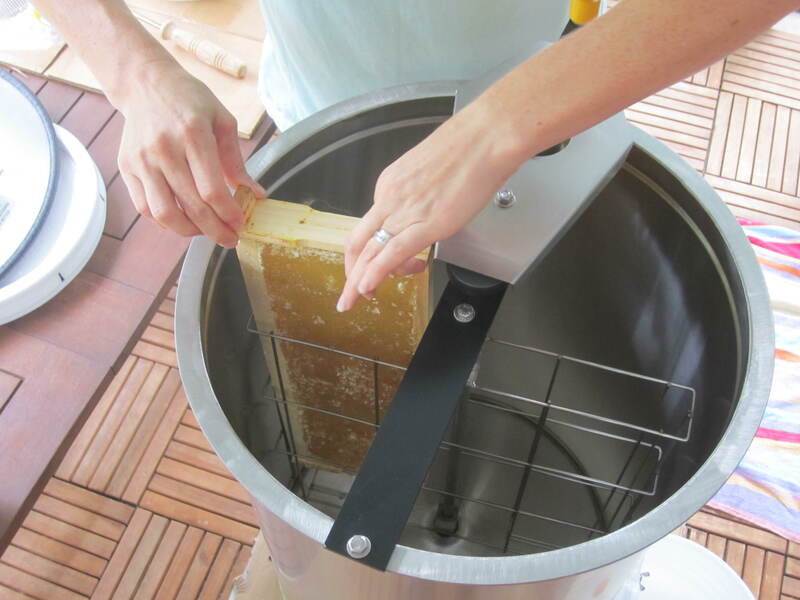 In order to get the honey out, we need to remove the wax cappings. One way to do this is an uncapping knife (or in a pinch, a serrated bread knife would work too). I think it would take some practice to become really efficient at it. I tried to take as little off as possible but I still managed to make somewhat of a mess. Any spots missed were hit with a few passes of the uncapping fork, which reminded me of a 80’s style hair pick, but sharper. 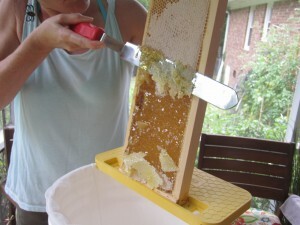 Trying to scrape as little of the wax capping off as possible to expose the honey. Using the uncapping fork to get any missed spots. Once uncapped, the frame goes into our extractor! We decided to buy our own radial 2-frame hand-crank extractor (Maxant 3100-2h)… It came highly recommended as a starter extractor, with the options to upgrade it to 9-frame capacity and ability to add a motorized drive which might be an option in the future. Uncapped and ready to go into the extractor! First frame loaded into the radial extractor. The second method we used to uncap the frames was a “rolling uncapper”. Basically it’s a paint-roller like device with sharp plastic spikes. By rolling it lightly across the surface of the capped frames the spikes poke holes in the wax, thus exposing the honey. I think it worked great, but probably more time consuming than an uncapping knife (with practice), especially if processing more than a dozen frames like we were. Finally, we were ready to start cranking! Rob taking a turn (pun intended). 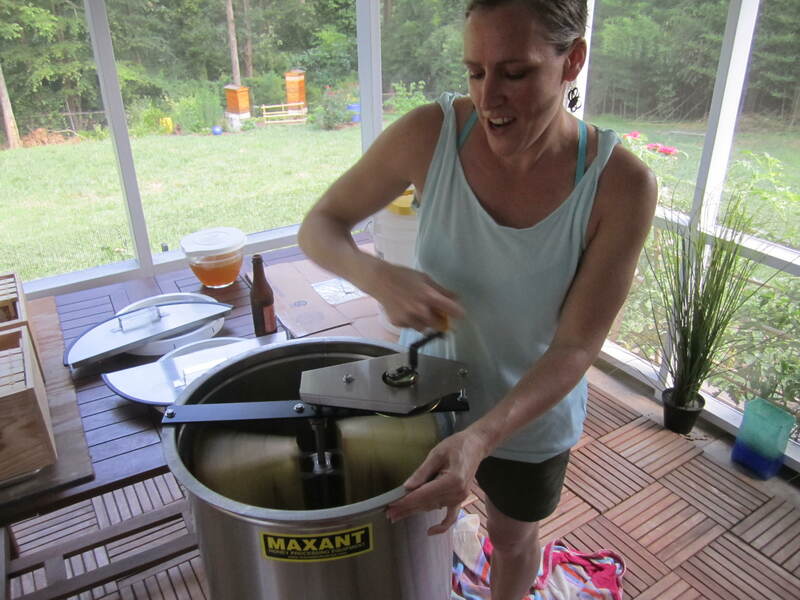 Honey and wax cappings collecting at the bottom of the extractor. 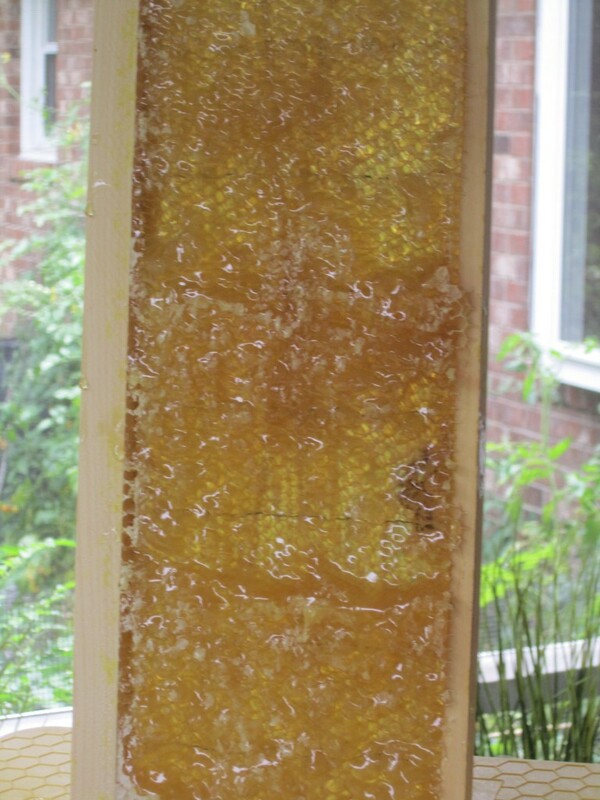 Once we had a decent amount of honey collected in the bottom of the extracting tank (each pair of frames were spun about 6-8 minutes each), we opened the honey gate to let it flow out, using a mesh filter bag to get the wax chunks out. 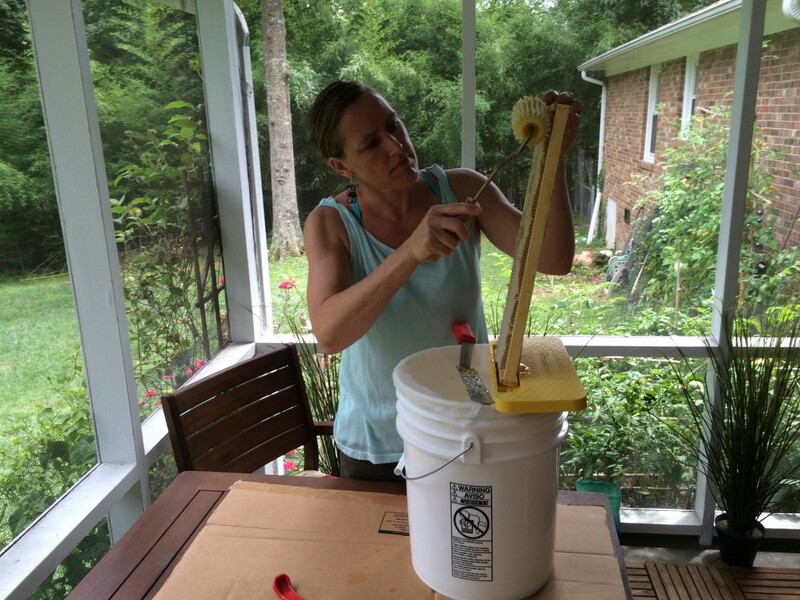 There are different pore size strainers out there, however, we decided to go with the coarsest one that would remove bee bits, wax, and other hive debris, but leave all the pollen and other good stuff that’s in raw, unfiltered honey. 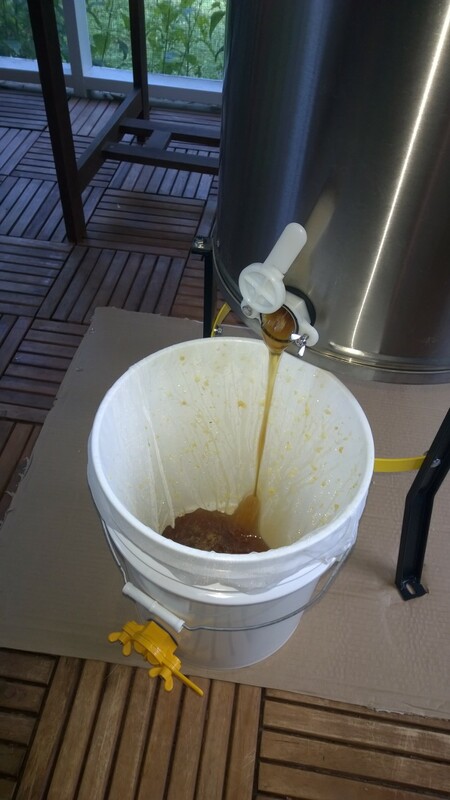 Honey flowing into the pail through a coarse mesh. After all was said and done, we extracted approximately 45 lbs of honey! This equates to roughly 3 1/2 gallons, or 13 liters! 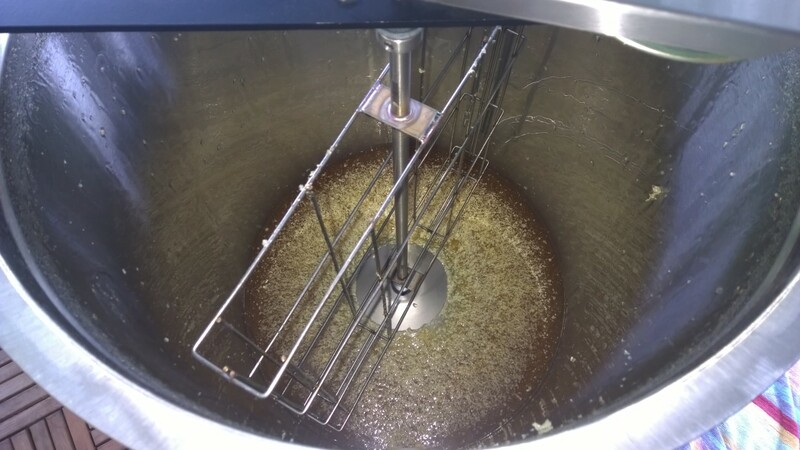 Right now we have it sitting in the pail, letting any air bubbles and very fine wax particles rise to the top which we will skim off prior to bottling. 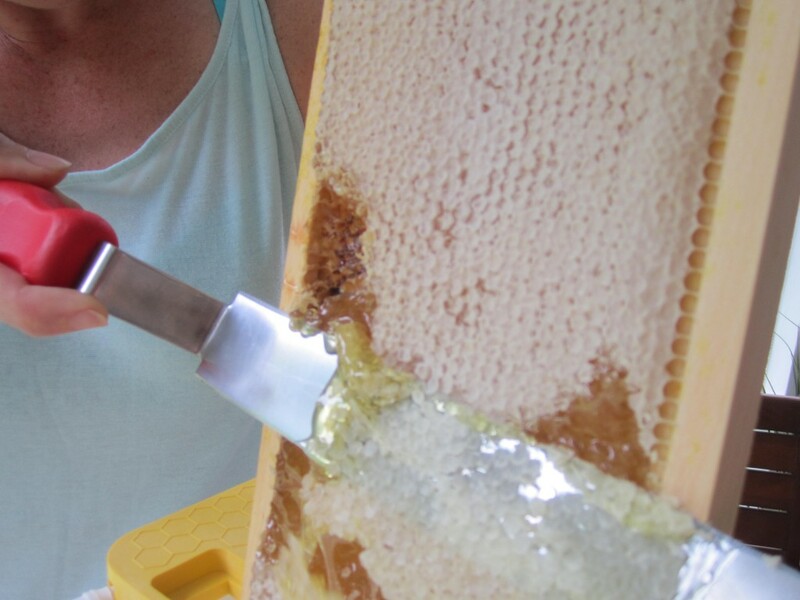 Stay tuned for more posts on the bottling process and final pictures of our first honey harvest! Great post. Can’t wait to get a chance to sample some. Have you designed a cute label for your bottles? I love the video, it’s so helpful. Congrats to the two of you on your glorious honey. Great post. Your honey looks amazing!!! I hope it is delicious. Will you have white honey?